The Beagle breed of dog was developed as a cross breed of several other breeds of hunting dogs back in England. 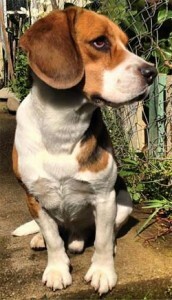 According to research, the beagles were developed for one particular purpose – to use them for hunting. This breed of dog turned out to be very active and great at hunting. They were a huge success and were used by the nobles for many centuries to hunt quail, foxes, and pheasants by using their scent. German Shepherd Dog is medium sized, slightly longer than tall, strong and well muscled, bone is dry, the whole dog presenting a picture of firmness. German Shepherd should appear poised, calm, self confident, absolutely at ease, and (except when agitated) good natured, but also attentive and willing to serve. He must have courage, fighting drive, and hardness in order to serve as companion, watchdog, protection dog, service dog, and herding dog. German Shepherd looks substantial and not spindly, giving the impression, both at rest and in motion, of muscular fitness and nimbleness without any look of clumsiness or soft living. The ideal dog is stamped with a look of quality and nobility – difficult to define, but unmistakable when present. German Shepherd Dog today is a true working dog: protective, loyal, and highly intelligent. The most popular breed for military and police service, they are also often chosen for search-and-rescue work, as well as a guide and hearing assistance dog. Bred specifically to work with humans, the breed is easy to train, and will learn commands at record speed. German Shepherd will tightly bond with your family, and protect his home and children. Expect the barking that might go along with his natural watch dog and guard dog instincts. German Shepherd is medium size, slightly stretched, stong, dry and well muscled, with strong bones, whilst the whole body must appear compact. The German Shepherd has ears which are middle sized, firm textured, broad at the base, set high on the skull, are carried erect (almost parallel and not pulled inwards), taper to a point and open towards the front. German Shepherd’s tend to live to around 12 – 14 years of age and even more in some case. German Shepherd’s love to swim however some just don’t like the smelly foamy baths they have to endure. German Shepherd’s are no different to any other dog as far as grooming is concerned. They would just love a 5 min brush everyday and once a week when moulting a half hour strip session is advised. This dog breed is developed in the 19th century in the county of Yorkshire, England to catch rats in clothing mills. Yorkshire Terrier is a small dog breed of terrier type, often called toys with terrier qualities, nicknamed the Yorkie. Yorkshire Terrier’s are clever, bold and independent animals with an energetic feistiness. Yorkshire terrier was and is a highly personable, spunky little canine that is impossible to ignore. Today, it is the most popular toy dog in Britain, and third in overall British popularity ranking. That of a long-haired toy terrier whose blue and tan coat is parted on the face and from the base of the skull to the end of the tail and hangs evenly and quite straight down each side of body. The body is neat, compact and well proportioned. The dog’s high head carriage and confident manner should give the appearance of vigor and self-importance, terrier temperament remained true. Training should be an important part of your Yorkie’s life. Bright and inquisitive, they appreciate learning new skills and showing them off for you. However, the terrier temperament quickly allows them to become bullies if they are allowed to think themselves in charge. The long steel-blue and tan coat may be the Yorkie’s crowning glory, but it’s his personality that truly endears him to his family. Yorkshire Terrier does not accept strangers and bark a lot, which makes it a good watch dog. Yorkies are generally healthy, but like all breeds, they’re prone to certain health conditions, Yorkshire Terriers don’t like the cold and are prone to chills, eye infections, teeth, and gum problems also can occur. Yorkshire Terrier coat should be a silky flowing coat of steel blue saddle and shaded golden tan in colour. Puppies are born black and tan. Yorkshire prefer some small meals to one big meal per day. Some dry food or bone should be given to it to chew, in order to keep its teeth strong and clean. Yorkshire Terrier is breed which can live up to 14 years or more. (APRI) America Pet Registry, Inc.